Introduction About an Outlook Add-ins! MS Outlook is a complete application and the basic design has all the functionalities. However, for more enhanced experience it has its own set of add-ins some of which are helpful and others might not. Add-ins which are available can be activated as per your choice and requirement. This means all of the add-ins are not activated when you configure the MS Outlook. Some add-ins also get installed in MS Outlook when any other Microsoft application or other online available third party applications are installed. One thing is clear that these add-ins do not play any importance in proper functioning or working of MS Outlook it only helps as the "added" functionality. There is a misconception regarding these default add-ins that they slow down the MS Outlook process but in case you have add-in which is not active and you are not using it then it might not slow down the MS Outlook processing. Where to Find these Add-ins in MS Outlook? 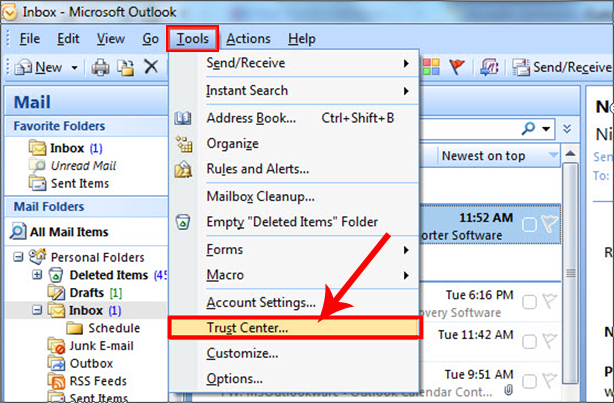 Once you click on the "Trust Center" another window will open. Choose "Add-in" on this window to display Outlook add-ins details. The list will show up the Active and Inactive Application Add-ins. Active Application Add-ins: This lists those extensions which are registered and are running on your machine. Inactive Application Add-ins: This lists extensions which are present in your machine but currently are inactive and not loaded. How to Disable the Un-wanted Add-ins? Many of the add-ins are not activated. 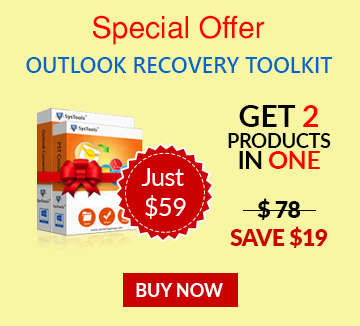 But sometimes Outlook Add-ins are not required and these can also make the Outlook run slow. To enhance the speed of the Outlook, you can anytime disable such add-ins which will in turn speed up Outlook. In same Add-in settings as mentioned above, you can got to "Manage" option and click "Go". A small window will open up showing all the add-ins available. You can check the add-ins which you want to make the changes. Outlook Add-ins can also be categorized according to the applications they get installed in your machine. Lets us see various types of Outlook add-ins and its utility. When you configure the MS Outlook application, some add-ins gets installed by default. You can disable it if these are not useful for you. 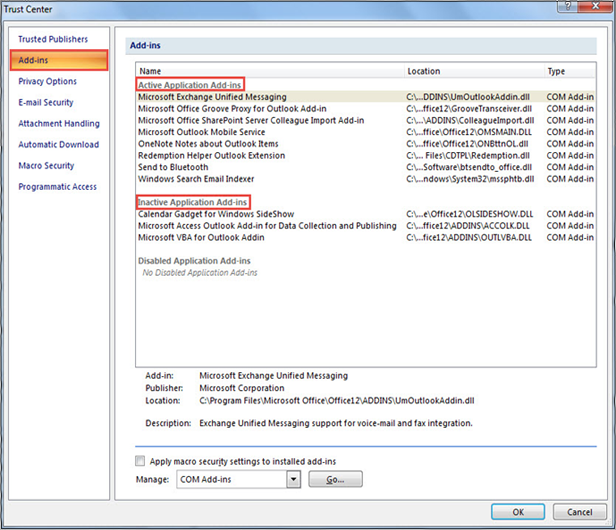 The default add-ins which gets in while configuring depends upon the version of MS Outlook. It also depends upon the additional utilities of MS Office suite you have installed from. 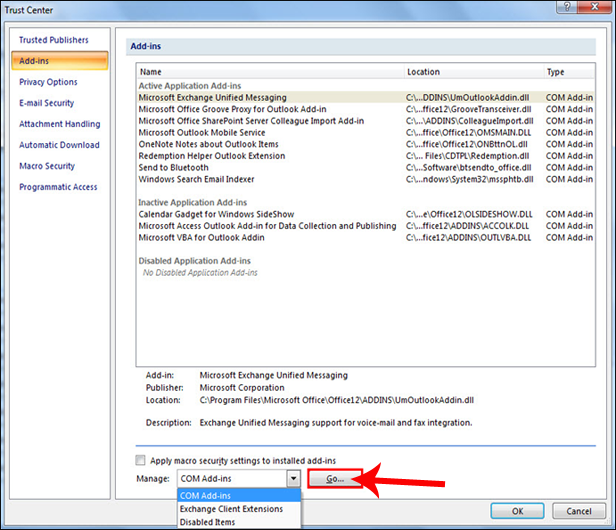 MS Exchange Add-in Exchange features can be utilized in MS Outlook using this add-in. In case you are not having Exchange account then configuration it is not required. Outlook Social Connector 2013 It is People Pane Feature displayed at bottom of Reading Pane. This add-in allows you to connect to social media sites like Linkedin, Facebook, etc. In case you are not much into social media it is not required. Business Connectivity Services Merge external SharePoint data in MS Outlook. Non SharePoint users might not need this. Microsoft SharePoint Server Colleague Import It is SharePoint based feature and is not required if you are not a SharePoint user. This add-in scans Sent Items folder to trace out names of colleagues who have been offered on a user's SharePoint My Site's Add Colleagues page. Microsoft Exchange Unified Messaging If you have MS Outlook 2007 and also have MS Exchange mailbox with Unified Messaging features enabled on Server then you can utilize this add-in. Otherwise you can disable it. OneNote Notes about Outlook Items This relates to OneNote application and helps you to have them linked with Outlook. One can auto-relate some functions between OneNote and MS Outlook using this add-in. Microsoft Access Outlook for Data Collection and Publishing In case you use MS Access then this add-in helps you to sync the data of MS Outlook with Access. Windows Search Email Indexer You can keep this add-in disabled in MS Outlook 2013 and 2010 because Outlook provides native indexing support. Many other Microsoft add-ins get added to the list of Outlook add-ins and these have connection to the other Microsoft applications or extensions which are installed in your machine. In case you are not suing these applications it is recommended to disable them. Some of the applications surprisingly add up some add-ins to your MS Outlook like iTunes. This application adds iTune Outlook AddIn, iCloud Add-in and Outlook Change Notifier. In case you do not sync your iPhone with Outlook via iTunes then the first and last Add-in might not be required. Moreover, iCloud Add-in is not used if the iCloud is not being used.